“…If the United States government were actually fighting the terrorism it claims to be, Saudi Arabia should not have received a dime of support in funds or arms once its ties to the Islamic State became common knowledge among the political powers-that-be. Of course, Washington already ignores the exacting human rights abuses the Saudis commit against their own people under a twisted amalgamation of monarchy, government, and religion. 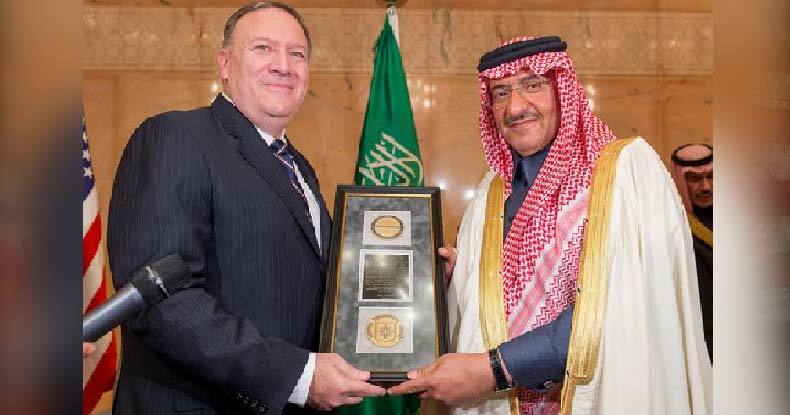 The irony of any Saudi winning an award for combating terrorism is staggering — particularly given revelations found last year in emails leaked by WikiLeaks showing the U.S. political establishment has been well aware Saudi Arabia funds and supports the Islamic State. “While this military/para-military operation is moving forward, we need to use our diplomatic and more traditional intelligence assets to bring pressure on the governments of Qatar and Saudi Arabia, which are providing clandestine financial and logistic support to ISIL and other radical Sunni groups in the region,” Hillary Clinton wrote to John Podesta in an email dated August 17, 2014. This effort will be enhanced by the stepped up commitment in the [Kurdish Regional Government]. The Qataris and Saudis will be put in a position of balancing policy between their ongoing competition to dominate the Sunni world and the consequences of serious U.S. pressure. Bin Nayef, 57, has been interior minister since 2012 and has years of experience in intelligence work. He oversaw a crackdown on al-Qaeda, a group that killed security officers and foreigners in the kingdom between 2003 and 2007. Bin Nayef vowed Saudi Arabia would continue to fight terrorism, and noted the Kingdom has thwarted a number of terrorist attacks, even against ally nations — though he didn’t elaborate on the nature of these alleged attacks. “We are surrounded by areas of conflict, and we were the first affected by terrorism from various sources, but we are equipped to combat terror in any place and under any circumstances,” the crown prince claimed. While his statement certainly sounds legitimate, for the crown prince to dismiss Saudi Arabia’s support for the world’s enemy number one, Islamic State terrorists — not to mention the Kingdom’s horrendous human rights record, thanks to Wahhabist Islam — is the epitome of hypocrisy. Hypocritical, but not surprising — and certainly far from shocking on the part of the of the CIA. If the United States government were actually fighting the terrorism it claims to be, Saudi Arabia should not have received a dime of support in funds or arms once its ties to the Islamic State became common knowledge among the political powers-that-be. Of course, Washington already ignores the exacting human rights abuses the Saudis commit against their own people under a twisted amalgamation of monarchy, government, and religion. Nevertheless, the pantomiming continues — the U.S. pretends to fight terrorism while arming and funding terrorists, and the Saudis do the same — each turning blind eyes to the other’s indiscretion and hypocrisy. Combating terrorism requires a joint international effort at all levels; financially, intellectually, militarily and through the media. This should be coordinated and conducted in accordance with the UN’s covenants and laws including particularly the principle of sovereign equality. Riyadh had grown somewhat disillusioned with the administration of former President Barack Obama, which appeared hesitant to engage in the Syrian civil war. Relations chilled further upon a highly-criticized international deal to lift sanctions on Iran, which agreed not to pursue nuclear weapons — a deal Pompeo has denounced. Our relationship with the United States is historical and will continue to succeed.